DALLAS — Saquon Barkley will hear his name called early in the first round of tonight’s NFL draft — with the only question being how early. 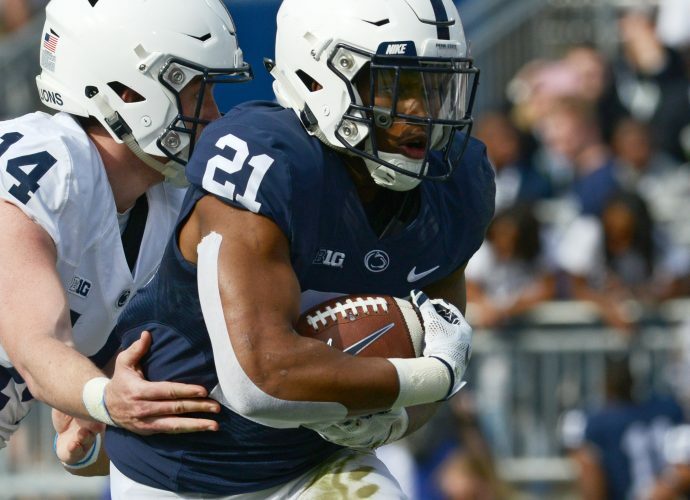 The Penn State star running back has been universally praised for his on-field skills and off-field maturity, and at one point there was talk of him being the No. 1 overall pick. Barkley is rated as the best player in the draft by ESPN’s Mel Kiper Jr. and Todd McShay. There are four quarterbacks expected to be selected early, and the Cleveland Browns figure to take one of them with the top pick. What the New York Giants do with the second pick will play a big role in shaping the first round. The Giants are heavily interested in Barkley and could pick him No. 2. But they also could take a quarterback, depending on how much longer they believe Eli Manning will play, or could trade the pick to someone else who wants to draft a quarterback. The New York Jets pick third and are expected to take a quarterback. The Browns have the fourth pick, and if he doesn’t go No. 2 to the Giants, then Barkley is widely expected to go to Cleveland at No. 4. The questions about where Barkley will be drafted have a lot to do with money and positional value. If he goes in the top five, he will receive more than $27 million guaranteed, a big number for a running back. ESPN’s Mike Greenberg said on Wednesday that the Giants would be “crazy” to take Barkley at No. 2 because NFL teams do not need a great running back to be successful. Analytics expert Bill Barnwell wrote an extensive piece for ESPN on Wednesday about why the Giants should not draft Barkley at No. 2. It all boiled down to money, in that a running back taken that high in the draft would receive a disproportionate amount of guaranteed money given the position. “There’s every reason to believe Barkley will be an excellent running back,” Barnwell wrote. It’s not out of the question that Barkley slips out of the top five, again based on the economics and depending on what happens with all the quarterbacks. The Browns could decide to take edge rusher Bradley Chubb out of N.C. State at No. 4, and the Denver Broncos are in need of a quarterback at No. 5. Trades, of course, also could play a major role in what teams actually wind up in the top five and how many of them want to take a quarterback. McShay recently wrote that he has Barkley tied for the second-highest grade of any running back he’s scouted since 2007. McShay gave Adrian Peterson a grade of 98 coming out of Oklahoma in 2007, while Barkley received a grade of 97. Still, showing that pre-draft grades can mean very little, McShay also gave a grade of 97 to Alabama’s Trent Richardson in 2012. The Browns took Richardson with the No. 3 pick, but he turned out to be a huge bust in the NFL and played only three seasons. This already has been a life-changing week for Barkley, who on Tuesday welcomed the birth of his first child. Barkley’s girlfriend, Anna Congdon, gave birth to a little girl that the couple named Jada Clare Barkley. Several other Penn State players will be drafted this weekend, but Barkley is considered the only first-round prospect. Tight end Mike Gesicki and receiver DaeSean Hamilton figure to be the next PSU players selected, possibly as early as the second round Friday.